It has been said by someone wise that you never step in the same river twice. Whatever you touch in passing is past, and if you return, something else will be there, as much as it may appear the same. 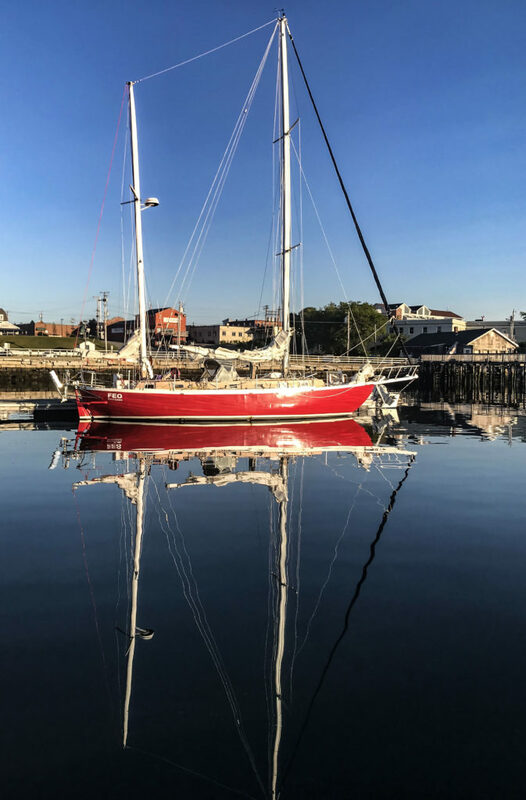 Feo at the dock on Rockland, Maine, after sailing in from Bermuda this year. I knew nothing of the Delta when I came into the Central Valley in 1975, an East-Coaster born and raised, looking for newspaper work, hoping privately to knock some boarding school edges off in an authentic Western town, and I landed a reporting job at the Stockton Record. The managing editor had looked at my resume, which included a stint at the Lowell Sun in Massachusetts, and exclaimed, “Bang! Bang! Bang! Three shots rang out and a woman screamed, and I was off on the greatest adventure of my life. Can you write that story?” Jim Hushaw was a jovial guy who manifested an almost illuminated expression of good will, and I said I thought I could. Thus does the direction and substance of one’s life change in an instant, in what a Hollywood screenwriter would later point out to me is the initial ingredient in all experience – the collision of bodies, particles, and ideas in time and space, often unexpected and unplanned in their nature – random, if you do not believe a Greater Hand is involved – that takes us down a different river, or a different body of water, on a course that we will take as we make it. The city was small by most standards, with a cluster of tired, brick buildings in the downtown – the last place prostitution was legal in California (and I would learn it had not been entirely eradicated) in those few commercial blocks now starved by mall development sprawling north of the historic center of town. The Record occupied its own block on the southern edge of those buildings, jammed up against a “highway to nowhere” that was someone’s idea for a crosstown expressway that someone, or everyone, decided not to finish. The end of it hung in the air not far from the newspaper truck docks as a monument to unfulfilled intention, or perhaps inadequate planning and limited funding, and people did not much like to talk about it. Locals liked to note then that Stockton was a place blessed to be within easy distance of so many attractions – San Francisco Bay, “The City,” the foothills, Tahoe, Sierra skiing and Nevada gambling – easily reached within two hours. And, to the surprise of some, it was an inland port, accessible via craft large as well as small, with its own shipping docks and warehouses transferring goods to and from the far world. The inland waterway aspect of Stockton appealed to me immediately because I had been raised around the water and had a dream of sailing some distance, at some point, if I could just find a way to do it. My first daughter, Emily, was about three or four months old when I borrowed a 25-foot sloop from one of the port officials who wanted me to “discover the Delta” and set out in that narrow waterway to see what it was all about. The Stockton shipping channel meanders out into the Delta, an area of about 1,100 square miles in total, on a course that seems to lead nowhere and everywhere, and if you happened to be in the right place at the right time you could see it literally tremble under the hooves of cattle that sometimes grazed there and startled the land into motion when they ran. The Delta islands comprise a flatland ocean of their own, spawning asparagus and other row crops that thrive in the fresh waters diverted from the San Joaquin and Sacramento rivers. This watery heartland of agricultural activity had long been the target of demands from Southern California, which drains much of it for southern consumption. Over the remainder of that water a California civil war might legitimately be fought one day. By the time we returned from our first little family sailboat excursion, I had run aground near Suisun Marsh and been forced to demonstrate the art of kedging, in which the hapless mariner rows an anchor out some distance into deeper water and returns to the boat to winch his stuck craft off the mud; the boom on this little-maintained sailboat had collapsed unexpectedly and dangerously near where Emily was now clutched breathlessly to her mother’s bosom; and subsequently an approaching ocean-going freighter had blown its horn in repeated 5-blast bursts, which I later learned meant he feared an imminent collision. He reported me officially to the San Francisco Harbormaster as an irresponsible and dangerous navigator who should not be allowed to operate anywhere near real ships with real captains. I had not thought there was any danger as I tacked back and forth across that narrow waterway to let the behemoth pass at his own deliberate pace. We didn’t have such things among the small islands of East Penobscot Bay where I learned to sail small boats as a boy, and it was not a source of worry to me, no more difficult to avoid than a slow-moving island. The water-borne trip from Stockton through Carquinez Strait into San Francisco Bay is a rare offering to tourists. I was once invited to join a mini ocean-liner excursion, expected to write a puff-piece advantageous to the sponsoring travel agent. I did not know this was an implied element of the assignment (for which omission I would receive an irate letter soon after) and so wrote a glowing essay on the Delta in all her falling-into-late-afternoon glory: the bright yellow-brown colors in the berms; the parallel row crops reaching their own vanishing points in all directions of the compass; a vision of the earth’s surface stretched to a point of cracking in which pearl-like fingers converged on the Bay, just as the city emerged a rough-cut jewel underneath a rising full moon, and its diametric perfection seemed to beckon one to go further, a magic spell of sorts under which I willingly fell. “I had known her first as a dream or perhaps an idea when I drove across the hot San Joaquin Valley floor when I barely knew my marriage would end, and came through the Valley of the Moon along the flat marshlands to the north of San Francisco Bay, swept down through the hills and riotous turns that lead into Sausalito, and walked the docks, alone but not aimlessly, with as much preoccupying my mind as troubling my heart. At least, that is the way I came to remember it, when time and experience had created such a filter to memory that I could only recall bare outlines and dim shadows of what I knew and when I knew it. Those words emerged years after I had left the Record and its many Stockton memories, including such assignments as covering the release of Patty Hearst from Pleasanton prison in pre-dawn hours. All we had to eat in that Stockton Record car – the photographer and I – was a single Snickers bar. How fortuitous that would turn out to be, and how like the universe to put that snack on my path! I would go on to work a few years later as an editor at the San Francisco Examiner, still looking for that special vessel. One day in in the Fall of 1985, after calculating the tax advantages of living on my own craft, I came down from my rented earthquake cottage on Potrero Hill to the bar/restaurant at SF Boat Works and spotted a sign extolling the virtues of an ocean-going ketch for sale that a Frenchman had sailed for 14 years around the world. I went to see him right away in his berth at Pier 39. Within a few weeks, aided by a college-roommate-turned- Texas lawyer who showed me how to buy an expensive asset by borrowing the down-payment from the seller, Feo, as she was named, was mine. “I really don’t have time for this kind of thing,” I replied curtly. “Oh, don’t be so uptight,” she said. This example of God’s lips to my ears – most WASPs raised in the East suffer a congenital fear of being too uptight – motivated me to drive immediately to the Huntington Hotel to find out what she really wanted. And what she really wanted was to get an actual reporter on camera talking about Snickers, her ad-agency client. This I was uniquely qualified to do by describing the life-saving impact of a solo Snickers bar in the Pleasanton prison parking lot as the sun overcame the horizon and we approached a state of legitimate starvation waiting for Ms. Hearst finally to emerge. The conversation in the Huntington Hotel in front of that little camera, stimulated by such stock interview questions as, “What color is love?” (“Aquamarine.”); “What would you do if you had $10,000?” (“Fix up my boat and sail alone to Hawaii.”); led improbably to a national TV campaign that paid me almost exactly – I kid you not – $10,000. 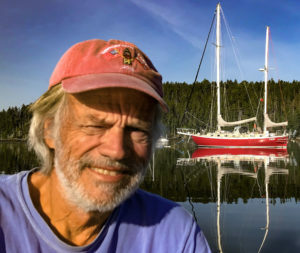 It came in unexpected royalty checks of $423 or $619 or even $1,234, and with that money I refreshed Feo, who after 14 years of hard use – rounding the Horn and sailing to French Polynesia, among other feats – needed new sails and refurbished rigging, and more. Soon I would set sail alone to Hawaii and back, which in many respects not only changed my life, but became my life. Emily would sail to Hawaii with me in Feo when she was 13, and later testify the experience gave her special skills in business to manage her fears. Her half-sister and brother would sail together on Feo from Newport to Bermuda more than once – my youngest would be the youngest woman ever to skipper that race (2018) – and discover things about the ocean and themselves that one only learns by going out there. August 1, 2018. 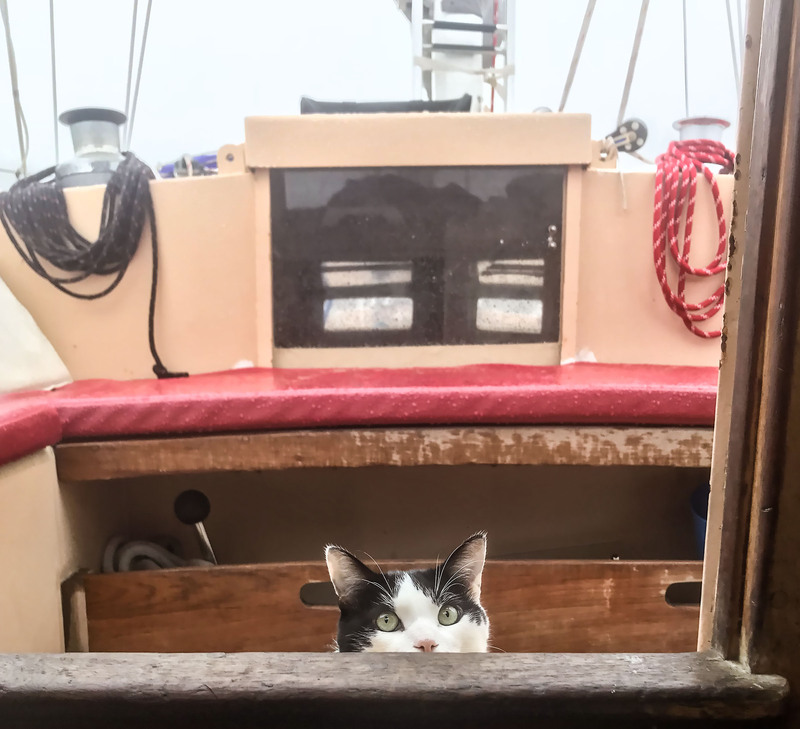 I am sitting now in Feo’s aft cabin, moored in Bucks Harbor in East Penobscot Bay, with Jack, my black and white Belgian Boat Cat. (My vet says there is no such breed, but Jack and I know otherwise. He is a kind of cat that believes he is a dog and behaves accordingly, with steadfast attention to his master and a willingness to go to sea). Jack stares at a swatch of sunlight about the size of a playing card that has entered through the starboard porthole and is working its way past on the cabin wall. It causes his head to follow the light, seeking the warmth. I wonder if he knows that the sun is not moving but Feo is swinging on her mooring. Of course, he does not. Jack and I are at rest for the time being, in a place near my origins, in a dream that became real, and I am remembering, as best I can, some rivers of time and experience that brought us here. 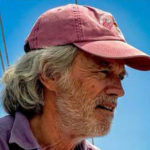 Eric Best is an independent strategy consultant (www.ericbestonline.com) and the author of “Into My Father’s Wake,” about solo sailing Feo to Hawaii and back and growing up in New England, available on Amazon. He worked for the Stockton Record as a reporter, editorial page editor and city editor from 1975-1983. I hope this awakens some old Stockton connections and the word of your magazine spreads far and wide, rapidly!!! Thank you for including me in your inaugural issue! I always tell Eric Best he is an author who could cause Hemingway to shed a tear. Poignant, descriptive and poetic. A wonderful float with you down the flow of the San Joaquin and Stockton memories. Yes, you could cause Hemingway to shed a tear. I shed a couple as I read. Regards to Jack. Eric Best, thank you for an outstanding article and superb writing. Writers like you will make this new magazine very successful! Your article was really interesting, having speed boated (is that a word? ), house-boated, sailed Mono-hull and Hobie Cats and water-skied the Delta, sailed the River and sailed to Santa Cruz and back from Stockton, and raced Hobie Cats from the Richmond San Rafael Bridge to Stockton, raced the San Francisco Bay while the Skipper hit a reef round Angel Island while trying to set the Spinnaker and lost the Spinnaker pole along with the Sailor and jibed around to pick up the Crew and then the Pole. Fun times. A long time ago but your article brought back many memories and what is sad is that many locals just don’t realize the treasure we have right out our back door! The water here is the magic. It reflects so much that you cant take your eyes away. Eric Best discovered it and puts it into words so well. Those of us levee walkers and visitors are in awe of the first fall fog rolling across the river and sloughs and the reflections from the summer sunsets. Each day is unique. Thank you for this memoir.